The other pages about the Grosser Kurfürst are numbered 70, 71 & 72. Hopefully this page will expand as new data becomes available. This page is, as is true with other pages, a work in progress! 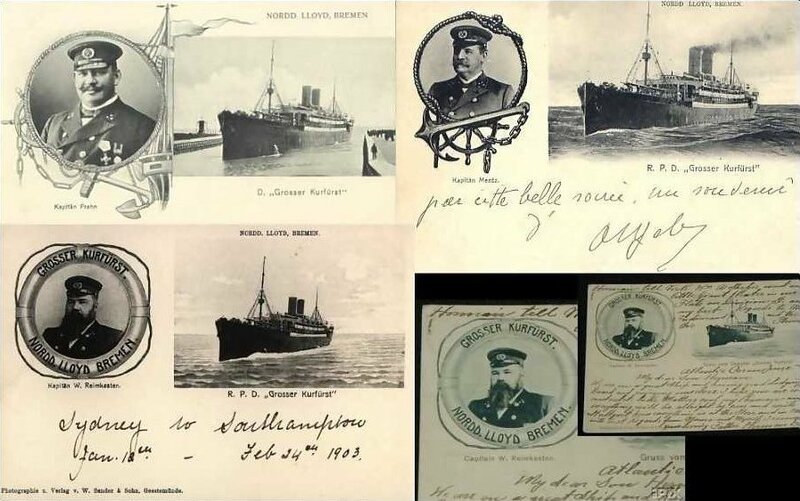 The page commences with some interesting early postcard images of captains of the Grosser Kurfürst, dating from 1903. But who knows what the page will contain in the future. The webmaster certainly does not know what will later be found & added into the site. If you can help with data & images, I would surely welcome your contribution. Now it would seem that passengers were given, or more likely could buy, postcards with the faces of the Grosser Kurfürst captain of their particular voyage. I guess that is still true today, isn't it? Anyway here is a multiple image with four such postcards from the early 1900s. The image at top left would seem to date from 1903. (Kapitän Prehn). The one at top right from 1905. (Kapitän Mentz). Below are two different cards with the same Captain - I believe from 1903 also. (Kapitän W. Reimkasten). All are ex e-Bay after a little assembly work on my part. Now James Rappaport, of 'Planet Books', Long Beach, California, kindly wrote in to say that he had a 1903 postcard of Grosser Kurfürst, mailed to Los Angeles from Cherbourg, France, featuring Kapitän W. Reimkasten. To add to my 'collection'. I feature it next. We thank you James! Thanks to Mr. Don Poppe, & his family archival records, I can now tell you a little about Captain W. Reimkasten - correctly Wilhelm (William) Christian Heinrich (Henry) Reimkasten (1850?/1905). He was born at or about 1850 (between 1850 & 1854) likely at Schwerin, Mecklenburg, Germany. He was Chief Officer of Main when that steamship became disabled off the New Jersey coast in Jul. 1883. In 1892, he was the Captain of Trave, a North German Lloyd steamer, which collided with Fred B. Taylor (which sank), on Jun. 22, 1892 in thick fog about 400 miles E. of New York. Trave carried Fred B. Taylor's captain (E. F. Hulbert) & 19 crew members to Southampton. Minimal damage to Trave in the collision, it would appear. In 1896 he was captain of Ems, also a North German Lloyd steamer, when that vessel became disabled & had to be towed to Fayal, Azores, by Wild Flower. And he was Captain of Bremen from 1897 to 1899. And, as we already know, he was a Captain of Grosser Kurfürst. Described in the New York Times as a 'careful & competent commander'. He married Anna Dannemann in 1883 & the couple had 5 children. He died at Bremerhaven, Germany, on Apl. 5, 1905, at the rather young age of 55. 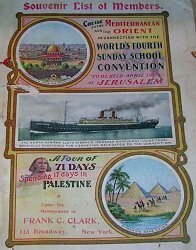 On e-Bay, as this page was first written in Nov. 2005, was a 40 page souvenir booklet (the cover page is at left) re a Grosser Kurfuerst 1904 cruise carrying passengers to the 'World's Fourth Sunday School Convention' in Jerusalem. The tour, which maybe commenced Mar. 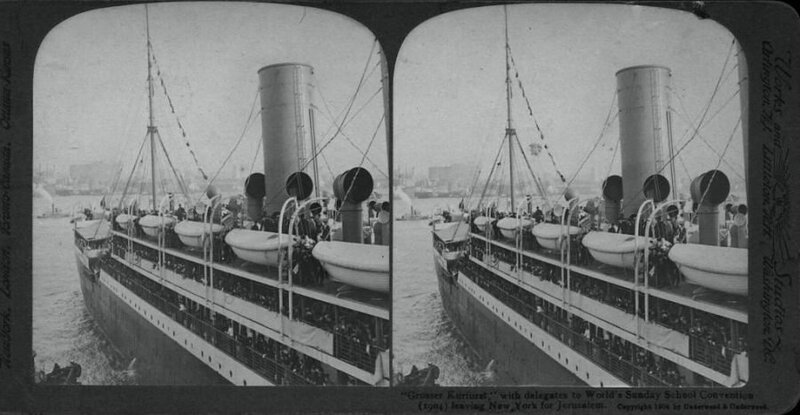 8, 1904 & lasted 71 days, was described as being a cruise to the Mediterranean & the Orient. It had, I read, two maps, one of which was shown with the listing. Included was a most interesting image which depicts Kapitän W. Reimkasten & his officers. Clearly the very same ship's captain as is featured in the lower images & in the biographical data above. I have not bothered the vendor with a request to use the listing images here. The vendor would appear to be a large dealer indeed, & I would prefer not to bother him & waste his valuable time. I provided however a link to both the item, & to the vendor's store. And invited you to visit both. But if the vendor would prefer the images to be removed, I will of course do so. The item sold for U.S. $9.99. The captain of the ship re a voyage from Naples to New York on Apl. 10, 1909 was was Kapitän Langreuter (no first name indicated) as per a passenger list offered in Feb. 2008. Which is a puzzle because a most beautiful menu dated Apl. 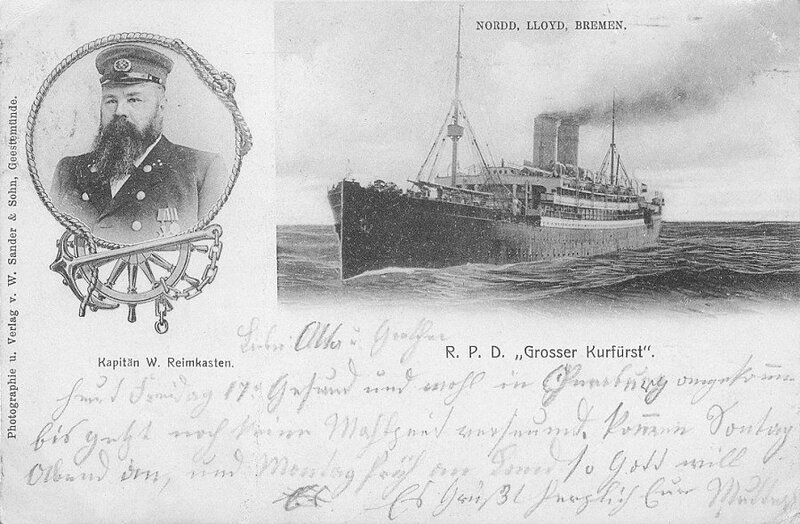 19, 1909 listed Kapitän G. Rott as the then Captain. Life brings, from time to time, some modest surprises. The webmaster bought, via e-Bay, a stereo card of Grosser Kurfürst, published by Underwood and Underwood in 1904. And, lo and behold, it is of the vessel leaving New York on the very same voyage to Jerusalem as has just been described. The image is a bit faded & when I darkened it I darkened also the descriptive text at the foot of the right image to the point that it cannot easily be read on this page. That text reads as follows: "Grosser Kurfurst," with delegates to World's Sunday School Convention (1904) leaving New York for Jerusalem. I also removed some marks on the images for better presentation here. But my scanning efforts do seem to show poorly the detail in the images. I hope that I can be permitted to feature next on this page a quite magnificent ornate beer stein, that features the Grosser Kurfürst. What a beautiful stein! And surely most rare. Having followed e-Bay listings re the vessel for a number of years now, only once before have I seen such an item listed, in Aug. of 2004 (image here). Such a stein was sold via e-Bay in Jan. 2006 - for U.S. $182.40. It is 11 inches tall & is, as you can see lidded. Made by Emil Sahm of Grenzhausen, Germany. 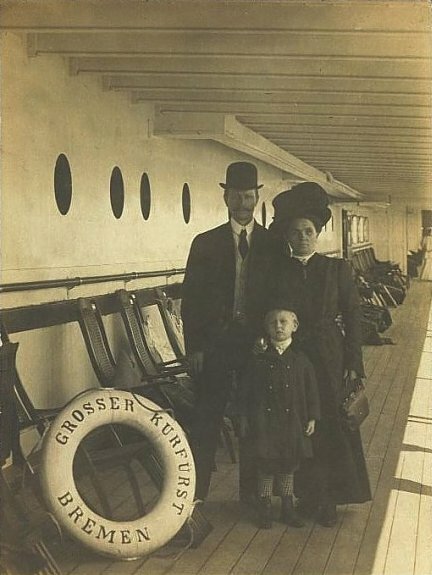 The vendor states his belief that it is of the Grosser Kurfürst on its maiden cruise from Bremerhaven to New York on May 5, 1900, though the specific date of manufacture is unknown. The vendor, whose specialty would seem to be china, describes it as being of 'the heavyweight type Pre Prohibition Brewery, Beer, Tavern, Saloon, Hotel, and Railroad type'. A beauty indeed! I have not sought permission for the (selective) use here of the vendor's many images, thinking that he might prefer not to be bothered by such a request &, being a major vendor, has probably limited spare time. I however sincerely thank 'uniondepothotel' of Indiana, the vendor. By way of thanks, I invite you to visit their e-Bay store both now & in the future. The above paragraph refers to the stein having being made by Emil Sahm of Grenzhausen, Germany, whose mark it bears. I understand, however, per Chris Wheeler, an authority on the subject, that the truth is rather more complicated. The stein body would have been made by 'Reinhold Hanke', then decorated by 'Emil Sahm'. And after that the pewter lid would have been added by a third firm probably also in Hoehrgrenzhausen (a conglomerate town made up of Hoehr, Grenzau, and Hausen in the Kannenbaeckerland near Koblenz). 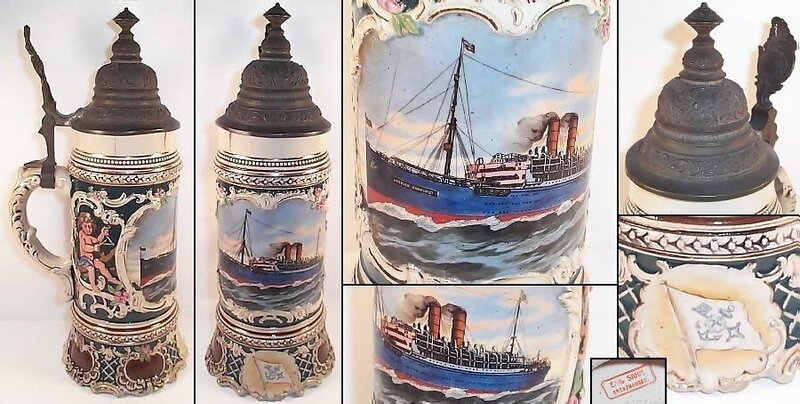 Dr. Roy C. DeSelms, of California, an authority indeed on the subject of antique beer steins, has kindly advised me that similar steins were made depicting other North German Lloyd ships. Specifically Prinz Friedrich Wilhelm, & George Washington. More information on old beer steins can be found by visiting the 'Stein Collectors International' website. Elsewhere in these pages, I have commented as to whether it is in order for me to present in my site pages images derived from e-Bay. The site IS non-profit & informational, most certainly. So I generally, when I present images from such a source, await the successful sale of the item. And then offer to remove the item should the vendor so request. Such then is the next image, which is of most of a postcard, maybe 80%. Why not show all the postcard? The bottom area of the card was blank. It was sold via e-Bay in late May 2006 for U.S. $39.99 & was stated to date from 1909. The vendor was 'historic_view_postcards2' whose site is here. You are invited to drop by their store. The image is very beautiful indeed. And I thank the vendor. Enjoy! From time to time, deck plans of the vessel become available via e-Bay. One was available in Nov. 2005. But I do not think I would know how to display such a plan on this site were I ever to come across a large image of it. 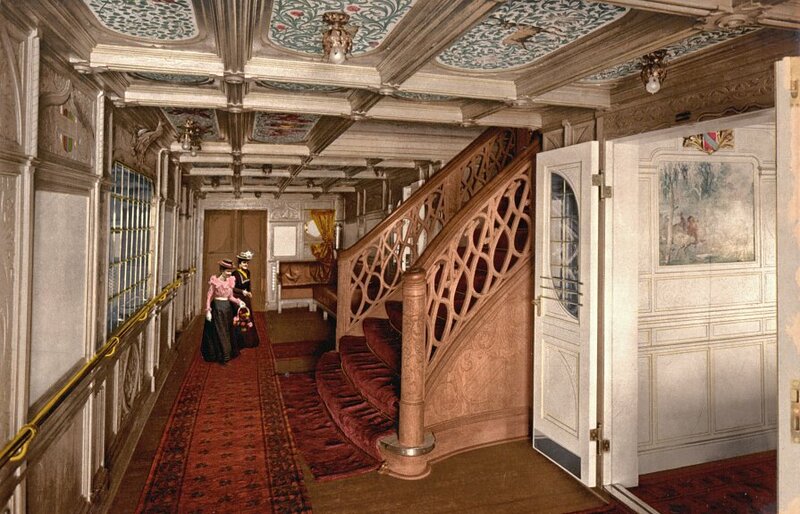 For a number of years, the webmaster has regularly seen, on e-Bay, early colour images of Grosser Kurfürst & particularly images of the interior of the vessel. And he thought, quite incorrectly it now seems, that the images were proprietary to the e-Bay vendor concerned & therefore not available for display in these pages without complicated permissions. Now, thanks to the kindness of Mr. Andrew Baker, I learn that the four images in fact originate with the 'Library of Congress' in the U.S., that all in the public domain, & that all are freely available to be WWW viewed in truly giant sizes. Giant? Yes, indeed. Like over 3500 pixels wide! The images themselves date, I learn, from about 1899/1900. They were created using the 'Photochrom' process, a process developed in Switzerland which created a colour lithograph from a black & white film negative. Clever fellows back in 1900 it would seem! The results are most impressive. What I next show is the 4 images, or to be accurate most of the four images. I prefer, in these pages, that a visitor be able to view images without the necessity to scroll, which I personally find to be quite distracting. There is some modest loss when I do that, so I invite you, should you so wish, to view the entire images also. You can do that via this 'Wikimedia Commons' link. Or directly from the easy to find 'Library of Congress' site. The images? 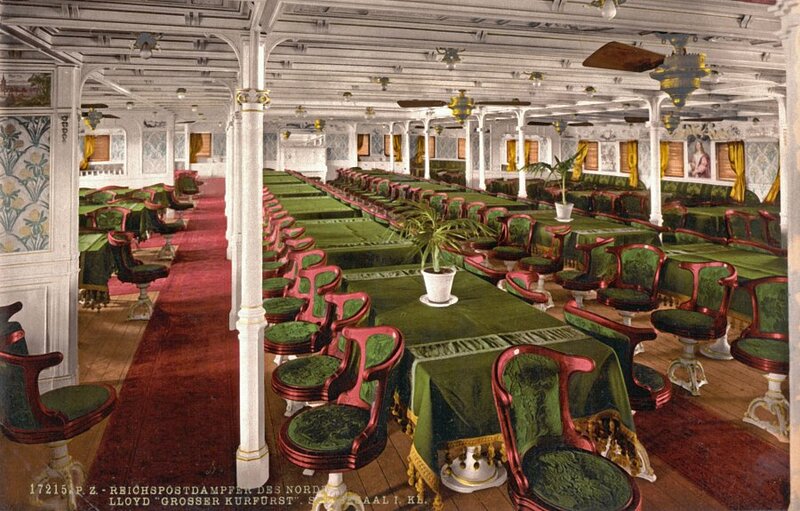 The first is of the First Class Dining Room. 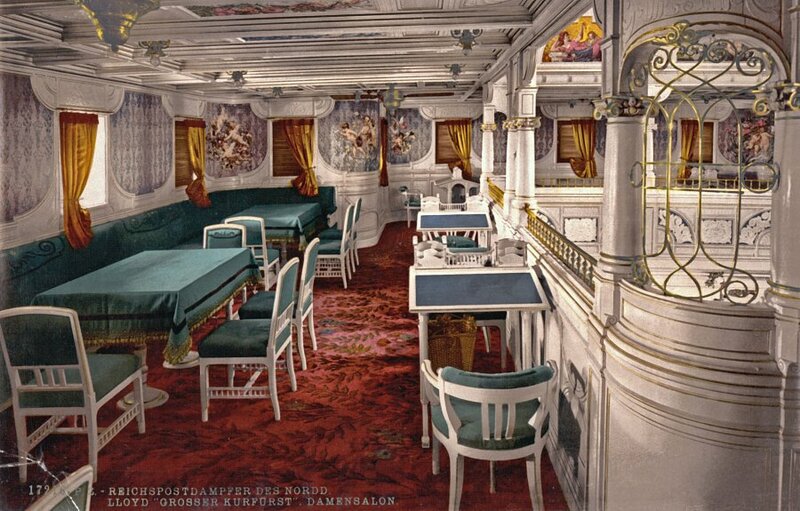 And the second is of the Ladies Salon. The third is of the 'Forward Passage'. 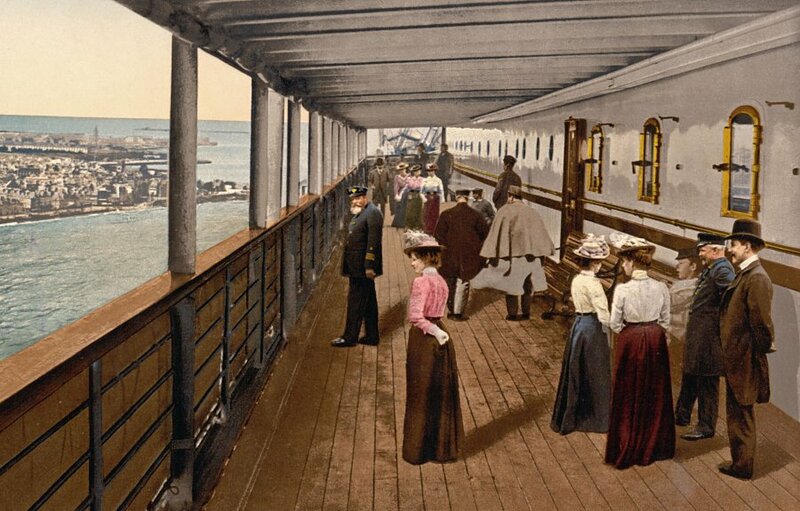 And the 4th & final image is of the Promenade Deck. Enjoy! Are they not all most impressive. The other pages about the Grosser Kurfürst are numbered 70, 71 & 72.